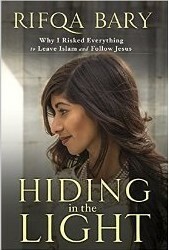 1 edition of Hiding in the Light found in the catalog. Add another edition? Are you sure you want to remove Hiding in the Light from your list? Published September 25, 2015 by Authentic Media in Colorado Springs, Colorado, USA . The compelling personal story of a teenage girl who stood against her family's faith to convert to Christianity and who gave up everything in her flight from religious persecution. In 2009 the story broke in national media of a teenage girl who had run away from her Ohio home, claiming that her Muslim father had threatened to kill her for refusing to renounce her Christian faith. Her parents denied the charges and fought to have her returned home, but she became a ward of the state, placed into foster care until she was emancipated at age 18. Today that girl is a young woman still living in an undisclosed location, still convinced her life is under threat, and still passionate about following Jesus, despite the risks. Teens and young adults will be moved by Rifqa's story of standing up to religious persecution, literally giving up everything to follow her faith. September 5, 2016 Edited by Todays Martyrs Reviewer Edited without comment. September 5, 2016 Created by Todays Martyrs Reviewer Added new book.